Heidi is doing amazing! She has met some people that came over to our house and she did amazing! She is also doing great on the leash. We took her to a dog park the other day to help socialize her with other dogs. She did wonderful. 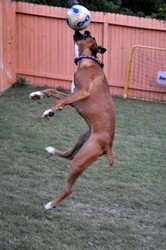 She was really calm around the other dogs, until she meet another Boxer. She started to ping around him trying to get him to play. I found it so humorous that she did this only to a Boxer. She knows her kind. 🙂 She is eating with no problems and definitely has an appetite on her!! We have found she loves this new duck we got her and the jolly ball with the hook on the end. LOVES them! She is truly a wonderful dog and we love her to pieces already! Even the cat is warming up to her! 🙂 Thank you for checking in!